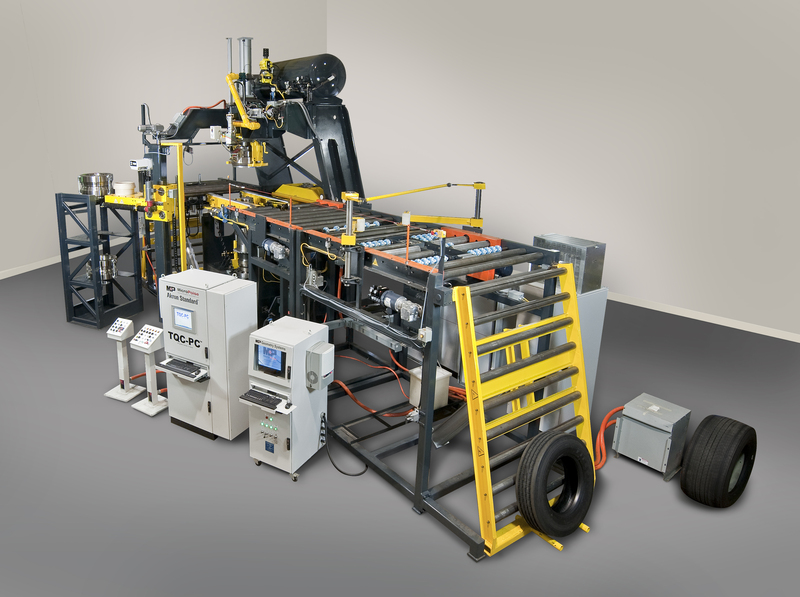 The FD90 Truck/Bus Tire Uniformity Machine measures tire uniformity for Truck/Bus Radial (TBR) tires. The purpose of the FD90 Truck tire evaluation center is to assure tire quality. This is done by measuring, grading, marking, and sorting tires according to force variation, runout, and sidewall appearance. The FD90 is designed to handle the size and range to process all radial truck and bus tires from 16 inch to 25.5 inch bead diameters. This means a single FD90 can do the work that previously required several machines. The FD90 is used for 100% tire checking in production. It can automatically adjust to different tire widths and test conditions for different tires within each bead diameter. Diameter changes are made quickly and easily with a rim assist mechanism. These features make the FD90 a high up-time, high-throughput, and ergonomically friendly machine. Runout is a measure of the “out-of-roundness” of a tire. Radial and lateral runouts also cause ride disturbances during each tire rotation. Sidewall Appearance is the visual quality of a tire, which is influenced by several tire construction features, such as sidewall splice, body ply splice, and component quality. On-screen diagnostic and troubleshooting tools and on-screen documentation make the FD90 easy to use and service. Special maintenance access corridors ensure easy set-up, maintenance, and repair. The FD90 has the best measurement repeatability of any machine in the industry. This means that there is very little measurement error. When more tires pass grade limits, factory yields increase.